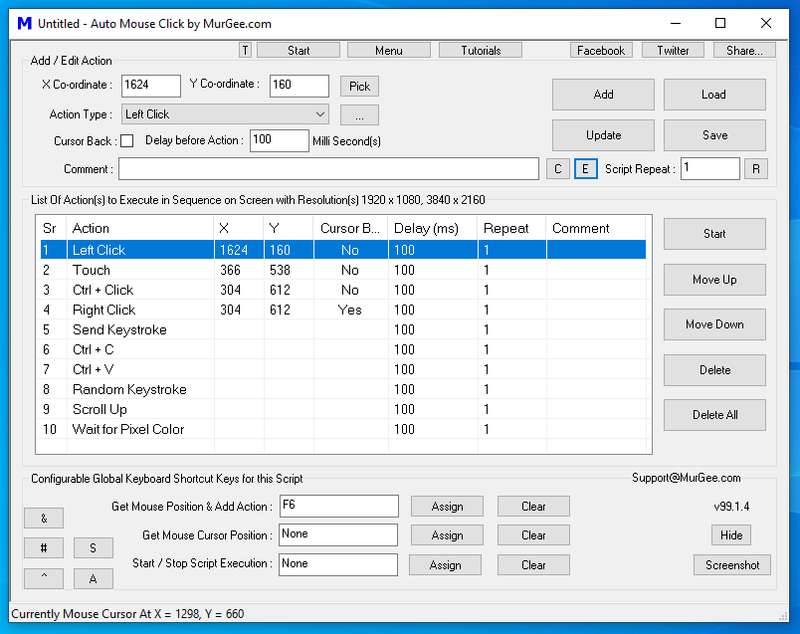 A Simple and Easy to use Windows Automation Tool titled Auto Mouse Click. Yes apart from Mouse Clicking this Windows Automation Tool can do lots of other Windows Automation Tasks. This Website provides Screenshots, Tutorials, Frequently Asked Questions and the Auto Mouse Click Download Link to get you Started with Windows Automation as fast as possible. Download and try out this Auto Mouse Click Software on your Windows Computer. This Windows Automation Tool works fine on 32 bit and 64 bit versions of Microsoft Windows. The Software is compatible with almost all latest Windows Operating Systems like Windows 10, Windows 8.1, Windows 8, Windows 7, Windows Vista and even with Windows XP. Automated Mouse Clicking, Keyboard Key Pressing, Starting Application, Opening Websites and lots more can be done with the help of this Windows Automation Tool. 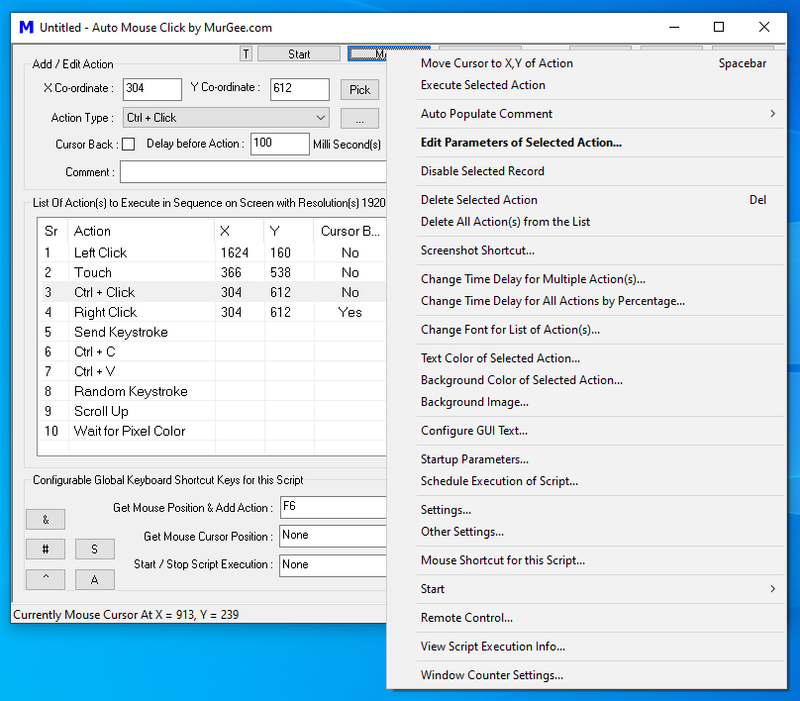 Screenshot of the Software displays list of Actions which can be Automated with Auto Mouse Click. This Windows Automation Tool is provided on a Free to Download and try Basis. Once you have fully evaluated the free trial version of the software, you can Unlock the Trial Limitation by paying in a One Time Registration Fees of $8.00 only. What can be Automated with this Windows Automation Tool ? The given below list of Features offers a Glimpse of what all can be done with this Windows Automation Utility. Yes More features are continously being added as per feedback received. In case you would like to make a suggestion, please do send an email to Support@MurGee.com. Left, Middle and Right Mouse Click at Current Mouse Cursor Position, at Random Screen Location (within a Rectangular Area), or at Pre-defined Screen Location. Bring Cursor Back Automatically to Initial Location after Clicking at another Screen Location. Automate Mouse Dragging as done with Left Mouse Button. Automated Scroll Up or Down Mouse Wheel. Press Keyboard Keys including AlphaNumeric Keys, Special keys like Function Keys, Enter Keyboard Key, Tab Key, Arrow Keys, etc. Send Keystroke(s) Directly to an Application Window, irrespective of whether it has Focus or Not. Record Mouse and Keyboard Actions in a Macro and then Playback Recorded Mouse and Keyboard Actions from the Macro Script. Launch an Application or Open a Website from the Macro Script. Play an Audio File (in .wav File Format) to Add Audible Alerts to Macro Script. Hear Text using Text to Voice Conversion from within the Macro Script. Capture Screenshot of your Desktop and Save an Image File. The Time Delay between execution of consecutive Script Actions can be assigned a Fixed or Random Value. Add Automated Text Typing with the Type Text in Comment Action. Export the Macro Script to a .CSV File and then Import it Back to the Auto Mouse Click Software. Apart from above listed features there are other Assistive Features which make using Auto Mouse Click Really Easy. Given below are Extra Features which allow you to Manage Single or Multiple Scripts easily. Use the built in Time Converter to convert Hours, Minutes and Seconds to Milli-Seconds and Vice-Versa. Use Profile Manager to create a Group of Macro Script to Easily Remember and manage Keyboard Shortcuts to Start and Stop Script Execution. For every Macro Script, you can Assign System Wide Keyboard Shortcut to Start and Stop a Macro Script Execution. Use the built in Video Tutorials to Learn all the Features of the Auto Mouse Click Software. Use Script Editor and it's Associated Right Click Menu to easily Edit single or Multiple Script Actions. You can Assign a Background Image or Change Color of Script Window so as to Easily Identify the Macro Script. Change Text of Auto Mouse Click Controls from Default to Text of your own Choice in your own preferred language. Execute Script Actions by doing a Right Click on the Script File (in Windows Explorer) or even with the help of Windows Task Scheduler. Use Version Selector to Switch between Auto Mouse Click version for Games and other Apps which do not require Admin Access. View Current Mouse Cursor Position in X and Y Screen Co-Ordinates in the Status bar of the Software. The System Menu offers extra features in the Auto Mouse Click Utility. It can be launched by Clicking on the Top Left corner of the software. You can Alternatively open the System Menu by pressing Alt + Spacebar. There is another Shortcut Menu in Auto Mouse Click which can be launched by doing a Middle Mouse Click on the Software. When using the Auto Mouse Click Software, you do have access to Video Tutorials from within the software itself. All the Video Tutorials are provided in .wmv File Format which can be played in Windows Media Player or any other Video Player. The Information provided above provides you ways to Automate your Windows Tasks. 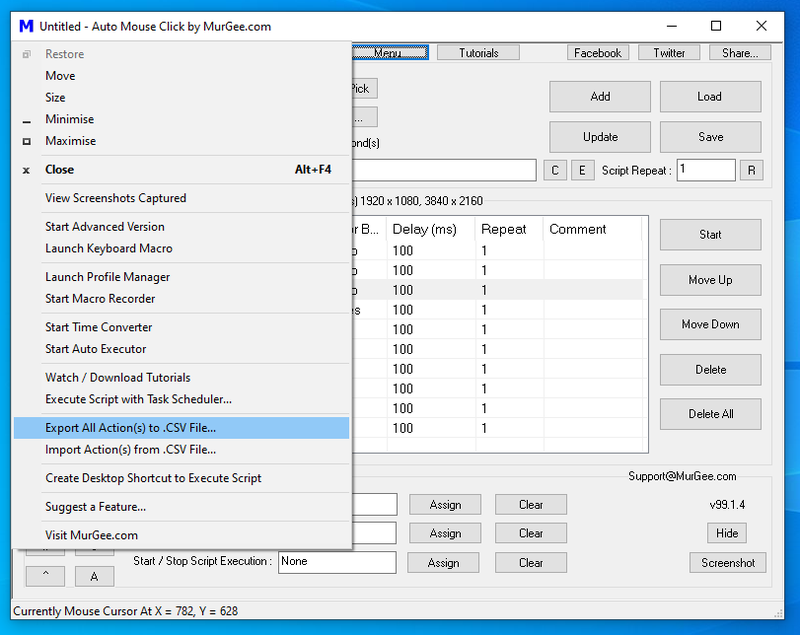 As the Automation Supported by Auto Mouse Click is done with the help of Mouse Clicking, Keyboard Key Pressing, etc, you can Automate almost any Graphical User Interface on your Windows Computer. You can also visit the Auto Mouse Click Software home to know more about it. Whether you wish need Mouse Clicking Assistance in a Game, need help with Pressing single or Multiple Keys in a MMORPG Game or you wish to Automate a Long Repetitive Task, give a try to this Windows Automation Tool and hopefully it would of help. All you need to Automate your Repetitive Task is to Plan appropriately and use this Auto Mouse Click Application to assist you in doing repetitive tasks.